Do you start your mornings and end your evenings with your face glued to your phone or computer? Do you know how often you pick up your phone to check notifications? If you’re like the average cell phone user, then you touch your phone 2,617 times per day ? And some studies even say the average user checks their email every 6 minutes. In our digital-centric lives, we’re becoming more tech savvy and social media focused by the day — and our physical and mental health can’t keep up. Quitting the use of technology cold turkey is unrealistic, especially if you’re job is to be digitally available every day, but taking a break frequently can do wonders for your well-being. Do you find yourself stressed out when you go more than a few hours without checking your email inbox or news feed? Believe it or not, this can be a sign of a real disorder called Social Media Anxiety Disorder. 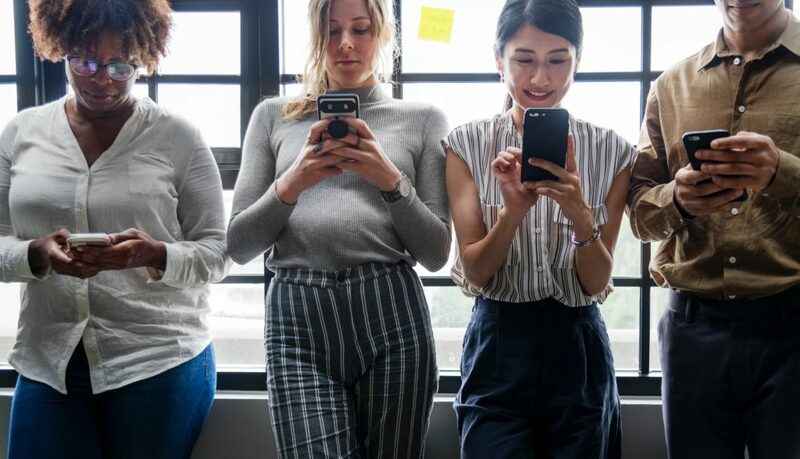 According to research, social media use is associated with a number of psychological problems, including anxiety, depression, loneliness, and more. It’s ironic how we spend our lives working on a computer, only to come home to continue conversations on a computer or cell phone – leaving little to no room for real human interaction. It makes sense that you reach for your phone instead of turning to the stranger behind you in line and striking up a conversation. Studies have concluded that use of digital apps fire up the pleasure center of your brain. So when you check notifications on your phone or respond to another email in your inbox, your brain is rewarding you with some much-needed endorphins. Besides the effect technology has on your real-world relationships, it also has negative effects on your physical health. Too much screen time can lead to eye discomfort and strain as well as muscle and joint pain. When you’re hunched over your desk, you can physically strain several areas of your body, especially your neck and back. Excessive use of technology can lead to a lack of physical inactivity as well. Second to smoking, physical inactivity is the second highest cause of preventable death in the world ? Taking a break from the screen will help you bring balance to your digital and real-world lives. Soaking up real time instead of screen time will ease anxiety, increase happiness, reduce multitasking, reduce those technology cravings, and allow you to connect more with the people in your life. It may even prolong your life. Is There A Better Time to Detox Over Another? If you feel groggy in the morning and pass yawns around the office, there’s a chance an overload of screen time before bed may be affecting your sleep quality. According to the New York Times, “smartphone and tablet screens set off brain receptors that are designed to keep you awake and interferes with circadian sleep patterns.” In other words, your tech is keeping you awake longer and making it harder to fall asleep. Surprisingly, the same New York Times study found that insomnia costs $2,280 in lost productivity per American worker every year. So by taking a break from tech on a daily basis, you will not only feel recharged every day, but you’ll see a boost in your productivity levels at work! To help smartphone users cut back on their screen time, Google and Apple recently added a feature to their phones that allows you to track how often and how long you’re using your phone. This new feature gives you a visual report on how much time you spend on certain apps and even how many times per day you pick up your phone. With new features such as “do not disturb mode” and being able to set a time limit for certain apps, you’ll be on your way to a digital detox in no time. So if you have to choose when to do a digital detox, consider powering down at night. Advocates of nightly digital detoxes, like Arianna Huffington, recommend that your phone is kept outside of your bedroom when you sleep. This way you keep the stress of work, notifications, and to-do lists from interfering with your much needed rest. And if you’re up for the challenge, consider having a digital-free day on the weekends a few times per month. You can do this by physically going somewhere that doesn’t have cell service or by simply deleting apps that you constantly use. Instead of documenting every moment of your weekend, you can enjoy each moment without the pressure of being constantly connected. Setting these boundaries to let your responses to work emails and messages wait until working days will help reduce your stress and improve your productivity and creativity. When your alarm goes off, try not to open your email inbox or scroll through Facebook to start your day. Instead, focus on building a morning routine that’s dedicated to your self-care. Consider making a healthy breakfast, reading an actual newspaper, showering, exercising, or even meditating every morning before hopping online. Taking a mini detox during your lunch break can help you gather your thoughts and focus your energy on getting through the rest of the work day. Maybe even grab lunch with a co-worker or friend to add some socialization and verbal communication to your afternoon! According to Dr. Richard Graham, a Technology Addiction Specialist at Nightingale Hospital, “if you establish a maximum daily time allowance for your devices then you will be more likely to stick to your detox.” Use the new features in your phone if you have a Google or Apple Smartphone to set limits to the apps you use on a daily basis. Setting these limits will help you build boundaries around your constant tech use. Turn your smartphone’s “do not disturb” feature on. This will silence all notifications on your phone, including phone calls, for as long as you have it enabled. This is a great thing to practice when you really need to get some work done during the day and don‘t want to be bombarded by constant notifications or urges to scroll through your Twitter feed. Integrating tech back into your daily life after a digital detox should be done with ease and consciousness. Don’t jump the gun here – don’t feel like you have to respond to every message and put out every fire the moment you log back on. Apps that have a minimalist design can help ease the feelings of information overload, especially when it comes to your email inbox. Spike strips away the unnecessary parts of traditional email so you can put your energy into focusing on getting more work done, instead of sifting through busy email threads. The design of your email inbox in Spike helps reduce information overload so you can spend less time actually in your inbox and more time doing the things you love — like working on exciting projects, spending time with family, exercising, or having a great meal with friends. Overall, there are some drawbacks to our dependencies to our digital addictions, but being aware of it is the first step. And taking steps to incorporate mini digital detoxes into your work day and week will help you better balance your real and digital worlds. Help minimize the time you spend in your inbox by downloading Spike here.